I thought I would let you know that I caught my first poacher using your tracker suit. The "dirtbag" was sneaking in on one of our management areas and hunting. He was being dropped off and picked up by vehicle. We knew he was doing it but he could see us from the woods and would just walk on down the road to meet his "pickup." I hid in a clump of sweetgum saplings wearing my "mossyoak" and he walked to within ten yards of me. The cool part is when I stood to collar him, it scared the crap out of him. He received his citation and lost his weapon. He did ask, "Where in hell did I get that suit?" Thank You so much for the fast reply to My question. Got the suit today, and LOVE it. Saw 3 large bucks this evening. Am totally thrilled with my order. Am going to recommend Your product line to every hunter I know. The ghillie is now as much a part of my hunting as a bow or gun. I received my Mossy Oak Ghillie Poncho today. It is just what I was looking for. 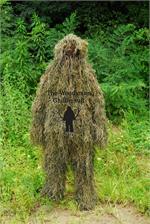 I looked at the Mossy Oak Ghillie Suit from Cabela's and your suit is just what we need in the areas we hunt. It is perfect!!!! My grandson thinks it looks like a brush pile. I know I will have all kinds of fun wearing it when we are in open fields turkeys hunting in the Fall and Spring. After using the suit I just wanted to let you know how my Mossy Oak Ghillie Suit worked out turkey hunting. It is the best camo I have ever used!! I moved around when turkeys were within fifteen yards of me and they must have thought I was a brush pile. I even sat out in open fields and the turkeys still walked around me. Deer do not know what to make of it. This spring I bought dyed jute from you, and used your product at the WPWilson matches for sniping competition. Your product was superior quality, and helped us get 100 in our stalk. Please feel free to use my absolute endorsement of your product. Thank you for your service in as much as you called me at work to make sure that your product was what I wanted. I recently purchased one of your suits for work and play. Just wanted you to know it's the best dam thing i have ever seen. I work in the narcotics division at the sheriffs dept, i have used the suite to get up close for pictures out in the desert at occupied meth labs. They never knew i was there, have some great pictures to prove it. The judge thought they were great too. Thanks for a great product that really works. Just received my suit yesterday, and all I can say is WOW! This is one of the most impressive suits I have ever seen regardless of price. I cant wait to compare it to some of the "hand made" suits the guys have at work and then top it off by telling them what I paid for it! The dimensional effect created by using the string is impressive and appears to be more durable than the burlap type. I have been involved with tactical law enforcement for over five years, and have seen many suits both military and law enforcement. In my opinion this is the best one yet! Thank you for all your help and I look forward to doing business with you in the future. I want to add my complements to Ghilliesuits.com I ordered the build-it-yourself kit and made a two piece jacket/pants stalker style suit for playing paintball. The colors are similar to the mossy oak kit but with a bit more green thrown in. The environment which I intended to use it for was the Lush mountains of Hawaii. We have a private field there and usually have around 10-20 players each week. When I completed the ghillie suit, and started using it in games, people got paranoid of leaving their bases after only a couple games! Only the new players would venture out into the open, and they usually have heard stories about a loose "Wookie" (my nickname thanks to the suit) roaming the mountain side that they open fire on anything that moves. Its quite humorous if they shoot at a bush right next to you because the leafs blew, but scan right past you lying there, bringing your sights to bear. I have had some people refuse to play entirely! The way the material is attached makes it almost impossible to break, and the colors blend in so well to the terrain here, we tried taking pictures standing 10ft away, and we could not identify the "Wookie" when they developed. Thanks for the Christmas card. It means a lot when a company like yours send cards out. I really am enjoying my woodland stalker poncho it has came in handy at work. Luckily we haven't had to use it on any real sniper callouts yet at the department. Again thanks for such a wonderful suit. I consider your suit top of the line among Cape concealment, Kusa, Custom concealment, as well as the rest. Your design is light weight,tactical, and breathable. I haven't found any flaws yet. Keep up the good work. Talk to you soon. To whom it may concern:Hello. Last week I ordered two of your "Tracker" Kits for our 24-our paintball scenario team, and I just recently got them in the mail on Monday. I would like to compliment you on your prompt shipping you provided. Moreover, I would like to praise you on the quality of the materials you use as well as the incredibly sturdy and simple design of your suits. The kit is just under half built, and it is looking incredible, and I already know that this design will be very rugged in a simulated combat environment. Good luck to your company! We wish you the best success! Jeff "Knightro" Penrose,24-Hour Paintball Scenario Team "Knight Krew"
BTW, I am the envy of the paintball field. I have laid quietly on the ground with my ghillie suit and gun wrap and have watchednumerous referees and opponents walk within two feet of me and never see me. I love saying "Don't tell anyone where I am." It makes them jump when they hear a voice but don't know where it is coming from. I also love taking one shot and getting one kill and listening to the opponent walk off the field asking everyone he sees, "Did you shoot me? Did you shoot me?" With your ghillie suit and gun wrap they never see it coming, nor do they know where it came from. I get more "kills" and last longer in the games than any of my team mates.The quality is undeniable. I have crawled through mud and waded through puddles all day. At the end of the day I bring home the ghillie suit and gun wrap and simply hang them up to dry and they are good to go again. You have done a wonderful job in choosing quality material and construction. I love my ghillie suit and can't wait to go paintballing this weekend, again. I received and assembled my poncho suit, desert orientation. It's great, it really is. I'm in a cold weather unit, but we're also gearing up for the Arabian Desert. In either environment, my suit works wonderfully. Through having the freedom to lay out my own color scheme, I was able to organize the suit so that it works with the pale grass and hibernating trees of a winter forest, or the bleak and minimal foliage found in the Arabian Desert. Thanks Again. Just want to thank for your service and let you know my Woodland Ghillie kit arrived yesterday.I am looking forward to making the suit and trying it out at my local paintball field.I had told my paintballer friends that I had bought this kit,they were all really excited to see the finished product and have me on their side! I will recommend your site to other paintballers as you sell a quality product.I will continue to buy your products in the future. Thank you once again. My Ghillie Suit arrived today. I am completely pleased with it is it is oneof the finest I've seen. The Woodland pattern is perfect for this area ofthe Northwest. My 13 y o boy, who is 13 going on 16in size, promptly put it on. This suit is better than the ones we used in 'Nam, cooler, and much lighter in weight. Being a Disabled Vet, and unable to hunt out of tree stands, thissuit is going to be a big aid to me, especially during bow season nextmonth. I have 200 acres here where we raise Horses, and 2 State Records havecome off this farm in the past 3 years. Thanks for the prompt service and a Great Suit---you guys do really goodwork, and you can rest assured I will be pointing others your way. Best Regards,Ed CopelandAvalon Farm. Dear Todd, I finally got a chance to try out my Woodland pattern ghillie kit I made. I wore it one morning for archery season here in Indiana. I had a doe, with her fawn, come within 8 yards of me and I was hunting on the ground! She caught me turning my head to look at her, and she never got spooked! She looked at me 5-6 times, and even took a step closer and began to graze! Great product, great price, great service, keep it up!! I just wanted to let you know how much I love your company's products. I made myself (actually my wife did 80+% of the work) a mossy gillie poncho. I used it for spring turkey hunting in the Zuni mountains near Grants, New Mexico. It worked like a charm. I had a flock of 6 or more hen turkeys come within 10 to 15 yards of me!! I even had 1 hen come with about 20 feet and look right at me! This was while I was exchanging yelps with the flock of hens. I also had another hen being chased by a tom also come within about 25 feet of me. If my shotgun hadn't been sighted in too low I would have had Mr. Tom in my pickup. Awesome product. I would definitely recommend your product. Thanks a million for an incredible turkey hunting experience. comments: I was just contacting you to say, that you have the best kits and Ghillie suits I've ever seen, I bought a Ghillie Kit from you, and made a sniper suit with it. I could not have been more happy. I will most likely be buying another one from you in the near future. I was using it in an Airsoft game and I had about 3 guys walk right past me without ever seeing me I shot all of them in the back, they were all in shock that they walked right by me. Merry Christmas to you, and have a great New Year. comments: As an avid Wisconsin hunter looking for a means to outsmart game, I felt the need for one of your ghillie suits while out pursuing squirrel and Spring turkey. A couple years ago I bought your woodland color poncho style ghillie suit. Just a few weeks ago turkey hunting, I was leaning up against a large fallen oak tree in a rather open plot of woods. I soon had two fox squirrels closing within 4 feet of me without knowing that I wasn't part of the natural landscape. I had to purposely move before they used me as a perch. Even after moving they simply stopped in their tracks and watched me for over a minute. If you know anything about turkeys, they have very, very good eyesight. That same morning I had a hen turkey come within 15 feet of me! For over 10 minutes she paced back and forth in front of me without ever having any clue to my existence. Wisconsin law permits only harvesting male turkeys in the spring so all I could do was sit back and enjoy her show. Thank you for a great product; it was certainly the best hunting investment I have ever made!! Just got my poncho-style Ghillie suit from you in the mail. Having shopped in stores for several weeks now, I am very pleased with the workmanship and overall quality of this suit which cannot be beat when compared to the competition. Can't wait to try it out this Turkey season here in Canada. I will recommend Ghilliesuits.com to all my hunting buddies; once they see me with this on, they will be begging me where I got it from!